[Get to Know] Korean Breast Plastic Surgery - Motiva Implant - 짱이뻐! A new breast implant has been introduced at Wonjin Plastic Surgery, following the previous round and teardrop breast implant, and Dual Chamber breast implant. 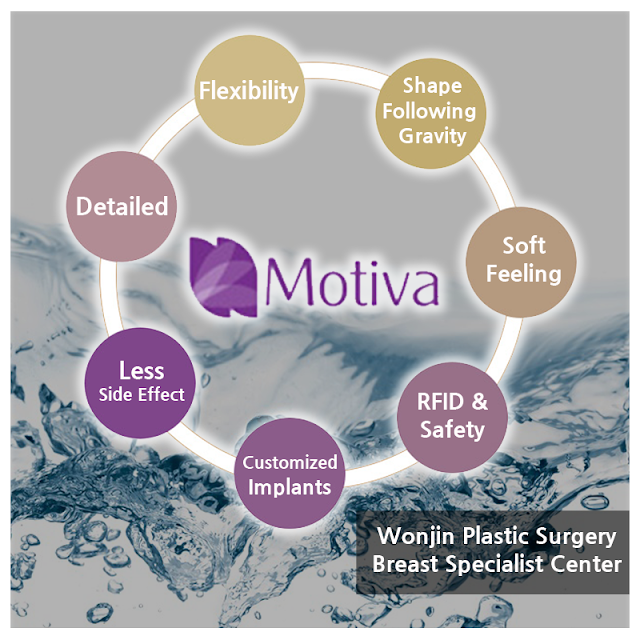 Motiva Premium Breast Implant, is the newest breast implant using cutting edge silicon gel in an ergonomic way which can reduce the incision part and has a high flexibility, if it's used for breast plastic surgery in Korea. being approved at 60 countries all over the world, Motiva Premium Breast Implant can be found only at 1% of high ranked hospital. Unlike the other implants, there are some important things to be paid attention to get the best effects of Motiva Premium Breast Implant . First, of course a know-how about breast surgery would be highly need, the skin of Motiva Premium Breast Implant is very thin and the elasticity of the implant itself is high. so a high understanding and delicacy about breast surgery is very important. Motiva Premium Breast Implant is divided into 4 types; Mini, Demi, Full, and Corse, and in additional to the implant shape, size, base and projection also has to be considered in order to achieve the desired result. The base of the implant itself will define the resulting cleavage, while the fullness is determined by the implant projection, and the cup is determined by the implant volume. Various types of Motiva Premium Breast Implant are available to be chosen based on the needs of the patient, and it needs much experience and understanding about breast implant to recommend the best choice based on the examination and the information of the patient. Motiva Premium Breast Implant is very sensitive so it will need full concentration of the plastic surgeon. As the implant will be inserted after the micro-incision, surgery equipment related to breast implants like 3D Endoscope (possible to observer the deeper parts that are hard to see) or Keller Funnel 2 (implant inserting device for minimal incision and tissue damage with less rotation rate of implant) are basic things and the plastic surgeon has to be skilled to use the equipment. But why it has to be Motiva Premium Breast Implant? Motiva Premium Breast Implant gel is using True Tissue Technology which is the combination of a specific elastic elastomer shell and the special rheological properties of Progressive Gel Ultima, that combine with the gravity to shift the maximum point of projection to the lower pole when the patient is in standing position. And when the patient is laying flat on her back, the implant will react in a similar way to a natural breast and the maximum point of projection will move closer to the middle point of breast. Motiva Premium Breast Implant is adjusting with the gravity to the patient's position providing the most natural look and feel as a result. Motiva Premium Breast Implant also using True Monobloc which links all components of the implant to the same tensile strength. Allowing the shell to act as a whole structure and making the insertion easier. It also improving the soft feeling that can be felt while using the previous round or teardrop implant, as its skin is very thin. BluSeal on Motiva Premium Breast Implant is preventing the diffusion of implants' gel to the body, and by keeping gel bleed to the minimum, the risk of capsular contracture also can be reduced significantly. With the BluSeal indicator, plastic surgeon can also verify the presence of the important safety component surrounding the entire implant. So compared to the other types of breast implants that has been existed until now, we can conclude that Motiva Premium Breast Implant has the most natural movement and line which gives the feeling of elasticity of the breast the most. And if the previous implants has limited target, this new implants can be inserted in any kind of breast condition as it has about 500 types that can be recommended based on every patient's needs. With only 2 hours surgery you can get the most natural breast even you don't have to be hospitalized. How awesome is that? How large the breast enhancements is also important. It'll take bigger ones longer to lower for their natural position. Just in case your bodily proportions is small, this could harder too. Positioning is also important. If they're placed inside the muscle, you could expect faster losing if they're underneath, it'll harder.